I started playing Magic back when revised was in the shops here in Oslo. It was very casual and mostly with friends from school. House rules were a necessity because no-one knew the rules that well. My little brother claims I insisted Mana Flare only counted for my lands. No wonder I appreciated that card so much. 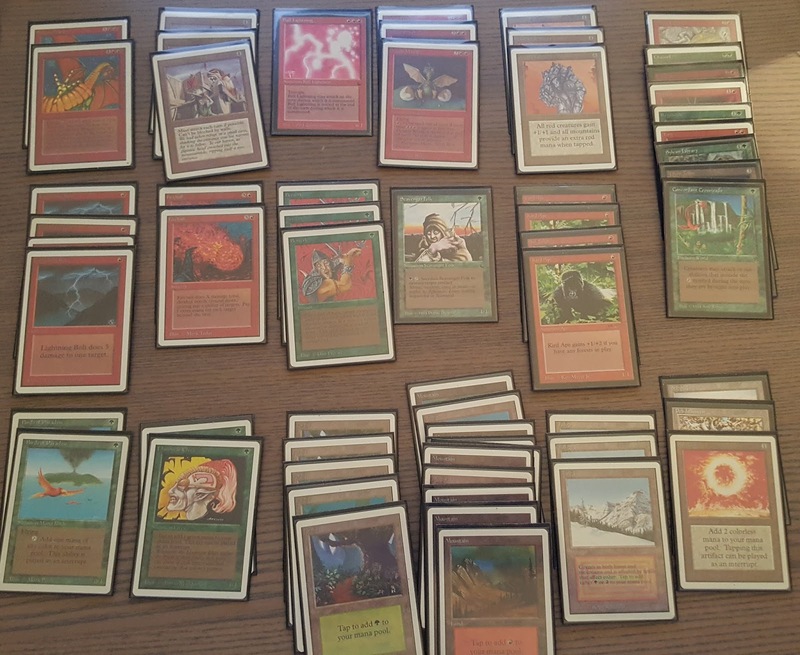 We had a few older cards, mostly we got ripped trading dual lands for common legend cards, I think. My mum actually managed to buy eight packs of The Dark for Christmas once, I think the local card store got an extra box in. I still remember not being too happy about expansions like Ice Age, I guess 93/94 was in my heart already back then. When I started high school, I put my cards away in a shoe-box. 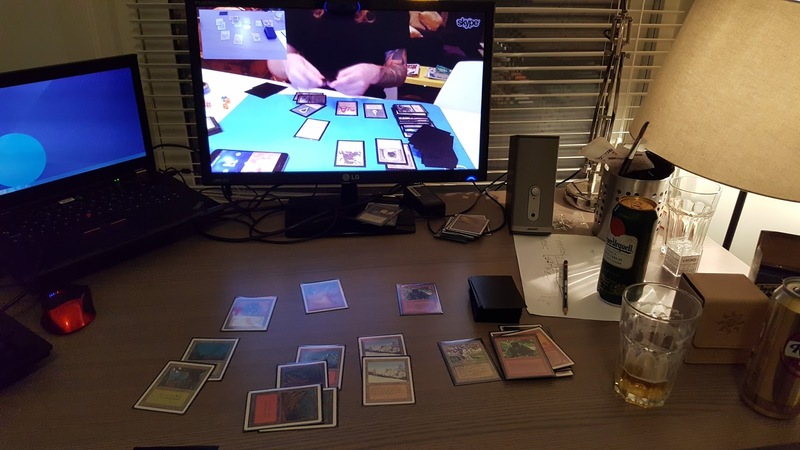 Geeky hobbies like Mtg had to let go. Since then my cards had mostly been in that shoe-box, or played by my little brother who continued playing. Until the day I started working with Magnus and he showed me his blog. 20 years later all I knew for sure was that I was still going to play red and green, maybe with black, but surely not white and blue. Everybody knows those colors are for weaklings and cowards. 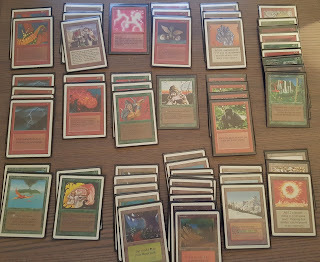 I didn’t plan to go all in on 93/94 either, maybe just restore my old revised deck as I remembered it, but one thing led to another and suddenly the cardboard crack got the better of me, with new shipments being ordered before the first one arrives. My current deck is under constant tweaking as I learn to play 93/94. My favorite kill is a Berserked Dragon Whelp with Gauntlet of Might. This is my build for an ongoing Skype tournament that allows revised. Suddenly I was able to hang out and play with people from all over the world. It has turned out a lot better than I expected it too. Old-school players are really chill, the format is really about casual fun and admiration of old cards. Rules are the “standard” Swedish B&R, but most people are ok with people playing revised cards. Personally, I play a couple of revised duals and a couple of birds, but I try to avoid going overboard and avoid proxies. I think most of us play to have fun with the old card, and even if I would probably win more if I added a few proxies for moxen and a lotus it wouldn’t feel right for me. Winning is less important than slinging old cards. Mostly, when I have time to play, I just post on the group when I have time and want to play, ideally the day before, but the same night sometimes works as well. As more players find out about 93/94 Skype I’m sure hooking up with players will be even easier. I’ve had quite a few matches the last weeks with Markus. This shows my first setup, without an external camera, but using an extra monitor. 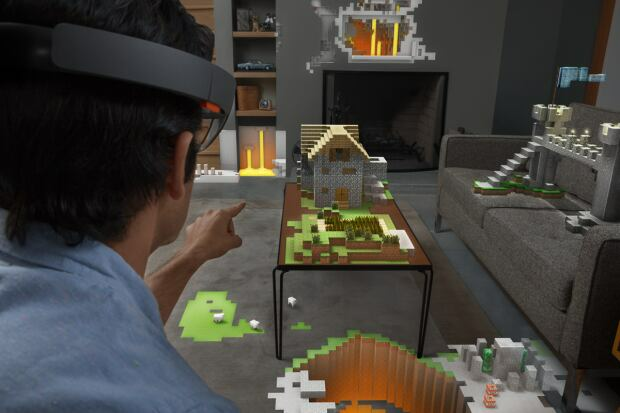 As more people join in on the fun, the Skype format evolves. One Sunday not too long ago we played a mini-tournament with four players, everybody got to play three matches with all three players. We had players on both sides of the Atlantic ocean. There are other longer-running tournaments being experimented with, and I’m sure we haven’t seen it all yet. We have even talked about traveling to meet up with some players to play IRL. My experience so far, is that tournaments are a lot more chill if you schedule in matches in different sessions. Hanging out, slinging cards, drinking beer is more relaxed if you don’t have other people waiting. At least for me, the 3x3 matches in one night was less chill. I did get to play a lot of different opponents, I did have a great time, but I prefer playing one person without time limits. Things you can do only on Skype: I can stand on my standing-desk while my opponent can sit down and smoke without bothering me. Having an old laptop with a bad webcam shouldn’t stop you from playing on Skype. No matter how good your setup is, you will not be able to read the text of a card without holding the card to the camera, so a simple setup will suffice. However, I have played around a little to try to optimize my setup. A stable connection helps a lot, not hearing your opponent clearly is more annoying than the video quality dropping. Getting good audio requires a stable internet connection. Wired Ethernet beats WiFi, so try to wire up. If you can’t, at least make sure you have a strong WiFI signal. If you don’t have an external webcam, there are a few tricks that works well. You can build your laptop up with a few heavy books to get a better angle, and if you have an external monitor you can avoid trying to look up on a bent screen on the book pile. You will get the best quality from external webcams. High quality webcams need to do compression to be able to send video feed to your opponent over the internet, if you have a beefy computer it should be able to do high res video (720p, at least) using your CPU to do the compression. If your computer is a bit slower, a camera with built in hardware encoding is definitely better. Cameras like Logitech’s C920 does hardware encoding of h.264 up to 1920x1080, that Skype for Windows can use directly without having to encode the video. I would definitely recommend the C920, I picked mine up used for about $50. Webcams need decent lighting. Avoid direct sunlight and spots that can give glares in cards. Direct back light can also be challenging. Built in mics normally work, but external speakers and a decent microphone is better. I use the built in mic in the C920 and I think that's ok. This is about as high quality as I have been able to get my video. As Bjørn mentions, there are occasional nuances, but really, if you have a good connection and decent webcam, you should be fine. Those two things are far more critical than anything else, in my experience. That's the same cam I use. Works well. I want a tripod too for stability. Those pro podcast mics look cool as well! I also joined the Skype FB group (thanks Mg). I don't have loads of free time, and it's probably tough that my evening is the middle of the night in Europe, but maybe I can catch a few games sometime. I have a buddy that comes over to play (various formats) about one night a week, and we both have 93/94 decks. I've played some people in the US but mostly on weekends, 2pm US time is roughly evenings in Europe... I think we have players from a lot of time zones. A map of players would be cool! MTG 93 94 is the best format ever. now on SKYPE, MTG online the way it should be: with real cards LOL I hope to soon join you all. 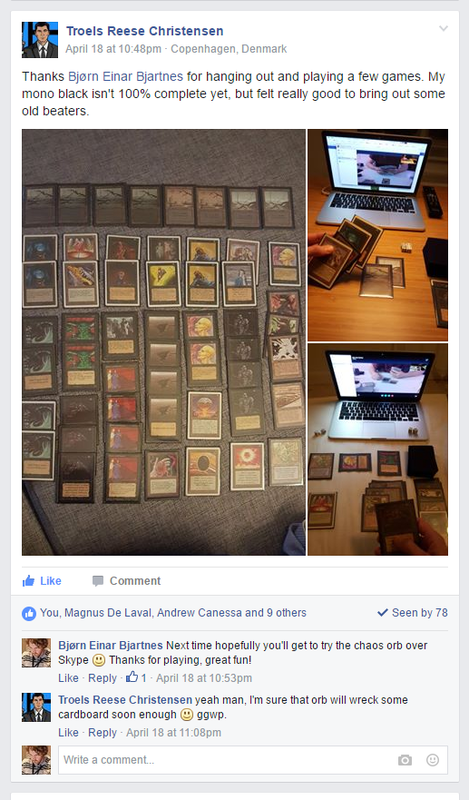 I discovered the same MTG Skype FB group that Bjorn wrote about after searching unsuccessfully for a local in-person group; it's been a fun way to chat and sling old cardboard! 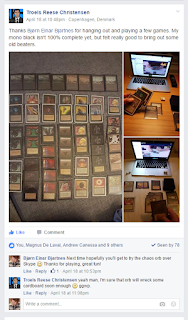 The people are very nice and have been gracious about helping me remember the old MTG ways after 10+ years away from the game (and even longer for old-school or "Type I" format). 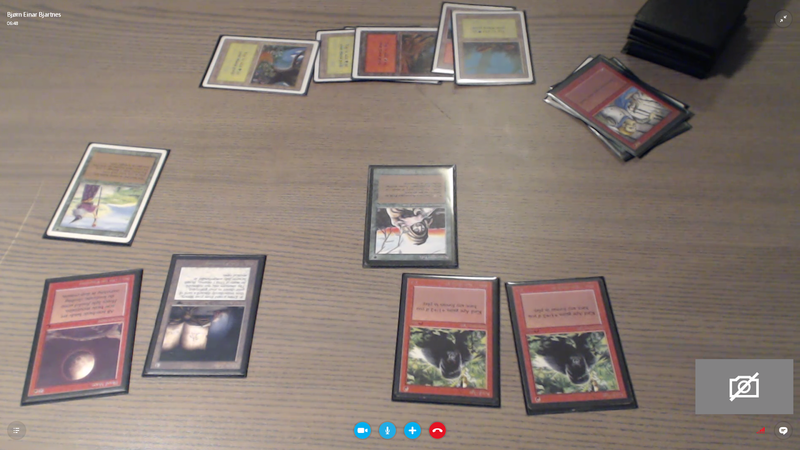 ...and perhaps that's the best part about MTG via Skype. No matter where you are, you're in the playgroup! does anyone here want to play me? Nice. Just signed up to the Facebook group and waiting on a few cards to show up in my PO Box so I can start gaming Old School. I've been waiting months for someone to play - if it's going to be via Skype, so be it. Just gotta get a decent webcam. I want to play mine is Zyntauro Jr.